Erik Weihenmayer — who lost his sight in his youth due to retinoschisis — had become the only blind man to summit Mount Everest. Summiting the highest mountain in the world, a feat some said Erik would never be able to accomplish, turned out to be just a part of his journey, a journey of breaking down barriers and overcoming obstacles. It started with Mount McKinley, or as the people of Alaska call it, Denali. He reached the summit on Helen Keller’s birthday. At 20,310 feet Erik felt on top of the world, but that was only the start. From there, his journey continued higher and higher. He decided he wanted to become the rst blind man to reach the top of the seven summits – the highest mountain on each continent — which led him to the highest mountain in the world, Mount Everest. As Erik prepared to reach the top of the world, he was faced with opposition. After all, even people who could see had failed to summit Everest. “These experts with years and years of climbing experience would tell me that it was a bad idea, that I was putting myself and my team at tremendous risk, and their reasons were valid. They knew a lot about climbing and mountains but they didn’t know me,” Erik says. 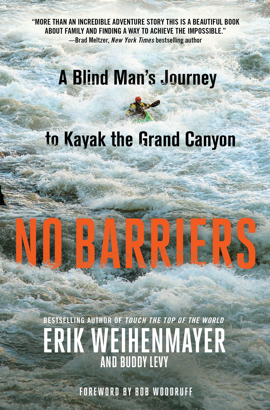 Instead of listening to the nay-sayers who doubted him due to his blindness, Erik trusted in the people who believed in him — those who had climbed with him, linked their lives to him and placed their fate in his hands. Erik knew he could not do this alone. He gathered together a team of experienced climbers and then went to the National Federation of the Blind for sponsorship, which the organization agreed to wholeheartedly. So when he reached the summit he didn’t just accomplish it for himself. The adventures kept going: Erik became one of only 150 mountaineers to summit the highest mountain in each continent and he kayaked all 277 miles of the Grand Canyon. But what matters more to Erik is the lives he has been able to influence. For over a decade Erik has been leading through his example of embracing adversity and making it an advantage through his foundation, No Barriers. VISION — Define a purpose that inspires you to give your best back to the world. REACH — Move beyond your comfort zone to grow and reach goals. PIONEER — Persevere through challenges to innovate. ROPE TEAM — Collaborate and connect with others to build strong communities. ALCHEMY — Harness life experience into optimism. SUMMITS — Find the gifts earned through the struggle. ELEVATE — Impact the world as a leader who serves. “The ultimate idea is once you go through this journey you use it to elevate the people around you,” Erik says. The book is now available for pre-order and will be released on February 7, 2017.